Xhibit® XC4 (96501) provides the capability of an Xhibit Central Station in an all-in-one computer with a 15.6″ touchscreen display. 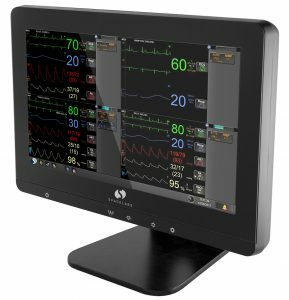 The medical-grade Xhibit XC4 brings additional flexibility to caregivers, enabling central monitoring of patient data in the patient vicinity. Whether mounted outside of two ICU rooms or installed in a nursing alcove, the XC4 can help increase workflow efficiency by enabling the clinician to more easily check patient vital signs in areas that are too small to house a central station monitor. Monitor from one to four patients at any location with connectivity to the Spacelabs Healthcare patient monitor network. Xhibit XC4 provides full interactive capability to admit, discharge, and modify patient information and to update parameter settings.